Christian Brown, an Annenberg graduate student, edits a radio script for a breaking news story in Annenberg's converged Julie Chen/Leslie Moonves and CBS Media Center. The USC Annenberg School for Communication and Journalism is a national leader in education and scholarship in the fields of communication, journalism, public diplomacy and public relations. The school offers a comprehensive curriculum emphasizing the core skills of leadership, innovation, service and entrepreneurship and drawing upon the resources of a networked university located in the media capital of the world. USC Annenberg's commitment to the converged practice of communication and journalism, interdisciplinary studies, and collaboration makes it unique among peer institutions. Students learn from theory and practice, and the school's programs put it at the crossroads of media, entertainment technology, and globalization. 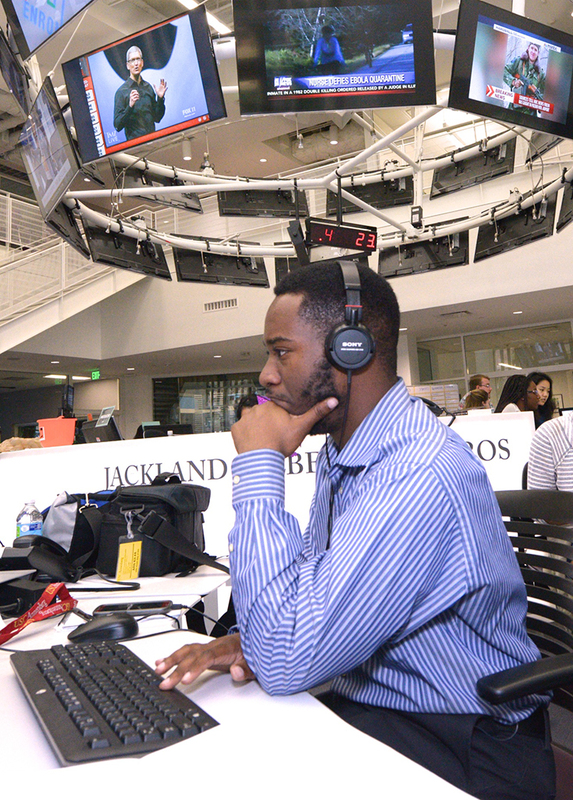 USC Annenberg's nationally accredited School of Journalism provides experience for students in all media platforms, with a digital newsroom, state-of-the-art editing equipment for radio and television news production and the opportunity to work at on-campus media outlets. The school's public relations program prepares students to thrive in advocacy communication, learning to write and communicate targeted messages across media platforms. The School of Communication's multidisciplinary curriculum explores how human interaction and technology affect communities, businesses, nations and the world, preparing students for careers in communication, persuasion and leadership. USC Annenberg's active internship program and study abroad opportunities give students the broad, global perspective required to be successful professionals. USC Annenberg alumni fill top posts in the communication and media industries, and remain an invaluable resource to students and faculty. USC Annenberg's more than 100 faculty members have been recognized in diverse fields, and their expertise challenges students to become communication leaders.